The CourseMill Learning Management System by Trivantis makes the delivery, management, tracking, and analysis of online learning across your organization easier and more affordable than ever. CourseMill is a scalable and customizable LMS solution available in a hosted or traditional software models. Ideal for blended learning, online learning and classroom learning. Fully integrated with Trivantis's popular Lectora authoring products. We have been on CourseMill for over 7 years and have been very pleased with the product and support. Pros: We like the ability to track student credit hours and the ability to allow students to easily register for classes that meet their needs. Cons: We really wish that data and transcripts could be imported from other websites or sources. The Advanced Reports software is a great addition, but it doesn't allow us to add SQL scripts on the version we are using. Overall: Tracked student hours, are able to communicate with users in several ways, gives students a catalog that they can look at to find classes they want to enroll in. Pros: The ease of use for our instructors roles and for our student roles. CourseMill is easy to navigate. I can have a new instructor up and running in a matter of minutes. Enrolling, pulling reports, etc. Cons: Managing Instructor Led courses has a few drawbacks. Especially when there are multiple sessions for the student to pick from. It takes communicating with the student outside of CourseMill for the enrollment process. Pros: CourseMill is very easy to set up and manage. Learners have a great experience using CourseMill to take their online courses. Advanced Reporting makes it quick and easy to pull leaning statistics. Overall: Easy to upload Lectora courses and to manage. The student interface is user-friendly; wish the Admin side & Advanced Reports easier to navigate. Pros: Ease of use; the student side is simple to navigate. It makes training new employees or outside customers really easy. I am looking forward to the new interface (v7.5). Cons: Advanced reports is complicated to use, but maybe this is a training issue. The Admin side sometimes is hard to navigate. I also would like to see a way to organize courses on the Admin side; maybe a way to categorize by tabs. I also wish you had a basic tutorial (video) on the forum that covers all the functions on the Admin side. I never received training from Trivantis, only from co-workers so this would really help me since I am the sole Admin now. Worst customer service ever! If they crash the site during upgrade, they won't respond or fix it! Pros: I like the advanced reports and the fact that it works well with Lectora. We have been Trivantis customers for 7 years. Cons: They have the worst customer service ever. Phone calls and emails are never returned, and if you call customer support it typically goes to voicemail. They moved from Ohio to florida in July, and use that as their excuse of not answering messages in December. They also don't put forth the initiative to fix things they break. I would not recommend Trivantis. Overall: It works well with Lectora. Pros: I have used Coursemill for an LMS combined with Lectora for course development. 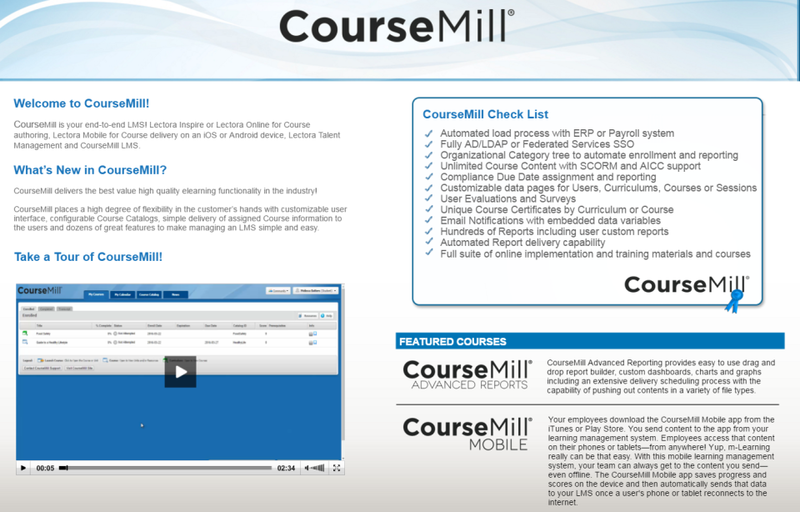 Coursemill has all the features needed for registration, delivery and reporting. Comments: We've been using CourseMill for nearly ten years. The addition of the disconnected Mobile delivery and the Advanced Reporting (dashboards, charts, etc.) for Managers has been a big win. The product allow a business like AYNI to service multiple clients using a single purchase of the CourseMill instance. This makes it extremely cost effective as a delivery platform.